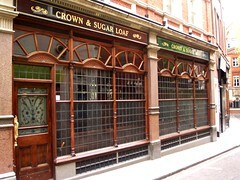 Samuel Smith's pub on Fleet Street. This used to be part of the Punch Tavern adjoining it, but was separated in the 90s and is now trading under the Punch Tavern's original name. Last edited 2011-06-26 14:14:48 (version 6; diff). List all versions. Page last edited 2011-06-26 14:14:48 (version 6).